RSVP Deadline May 17: Use RSVP Form here. Please reserve your seat early. Those with reservations will be seated first. RSVP Deadline June 14: Use RSVP Form here. If you answer yes to any of these questions, don’t forget to register or update your voter registration. There are several helpful online tools and forms which can be found here at OCVote.com. A current listing of federal and state officials is available here. Contact NBWDC to request a link to our online Candidate Questionnaire. Renew your membership or join now to receive full Club Benefits, such as voting rights, members’ only news and invitations to special events. Membership is valid for from January 1 through December 31 each year. Several membership categories are available (see below). And you may conveniently pay for your Annual Membership by either credit card or by check. Note: Donations and payments to political-party organizations, like NBWDC, are not tax deductible. If you wish to pay by check, please print our Application/Renewal Form, fill it out, attach your check and mail it to the address on the form or bring it to our next event. We look forward to hearing from you. Have you moved or changed any of your contact information? We are required by our Club Charter to maintain accurate contact information for all our members of record. If you have recently moved, changed your name, email address or phone number, please let us know so that we do not violate our charter requirements. Thanks for your help in keeping us in compliance with the California Democratic Party requirements. With gratitude and thanks, we wish our outgoing officers (Rima Nashashibi, President and Karen Hinks, Vice President) best wishes in their future endeavors. If you have an interest in any of these areas, please let us know. Send us an email or leave us a phone message (949.423.6468) and we’ll get right back to you. Letters and calls to our legislators, letters to editors, Social Media postings, conversations with friends. These are all important tools to help get the word out and building support for issues that are important to women and Democrats. Find an issue you are passionate about and do your part to join in the conversation. A current listing of our federal and state elected officials is available here. Our mission is to provide a forum for civil political discussions and promote and participate in activities that help educate members about local, regional, and national issues. 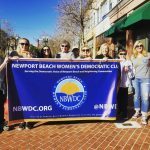 The Newport Beach Women’s Democratic Club was formed by a small group of like-minded Democratic women who were brought together by their desire for civil discussion around political issues. Within a short time, our club grew and became a notable presence in the Orange County Democratic community. We promote democratic values through activism. 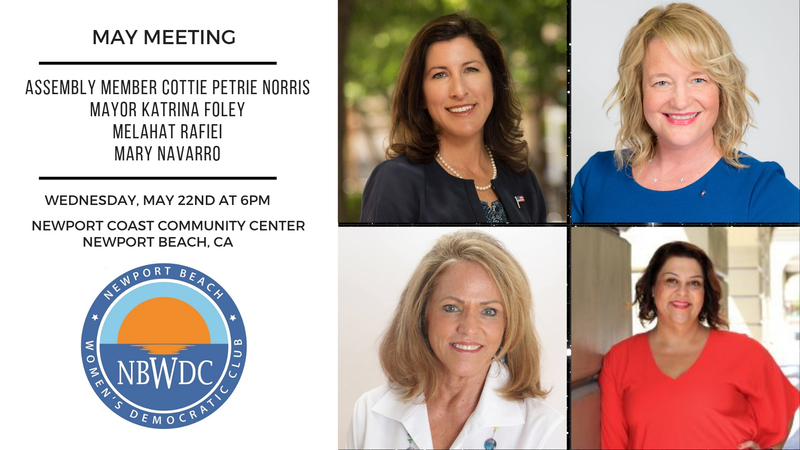 Our work includes get-out-the-vote efforts, presence at community events, and sponsoring forums for Democratic candidates as well as candidates for non-partisan offices. We also speak publicly and take part in demonstrations. Club membership is open to women who are registered Democrats. We also welcome registered Democratic men as non-voting associates. While most members live in Newport Beach, we also value those from surrounding Orange County communities. At our meetings and events, we welcome those who wish to be benefactors of our Club regardless of party affiliation. For more information about our Club and Membership, please fill out the Contact Us Form above. Honored as Coalition Partner of the Year in 2011 by Planned Parenthood of Orange and San Bernardino Counties for our support of their organization.